I’m starting to get a nice little collection of Anthuriums. Also known as tailflower, flamingo flower, and laceleaf, the flower of this tropical plant is quite impressive, but it’s my latest acquisition that is a royal stunner. With dramatic burgundy flowers that can also range from black to brown (I’ve been watching the colour lighten as the flowers age), meet the Black Queen Anthurium I couldn’t walk past recently. I use the term ‘flower’ lightly because it’s actually the spathe leaf that is the unique, colourful feature of this plant, and they do come in a wide variety of colours. Just Google Anthuriums and check out the images in the results. They are stunning and I think I’ll be looking to acquire a white one next. 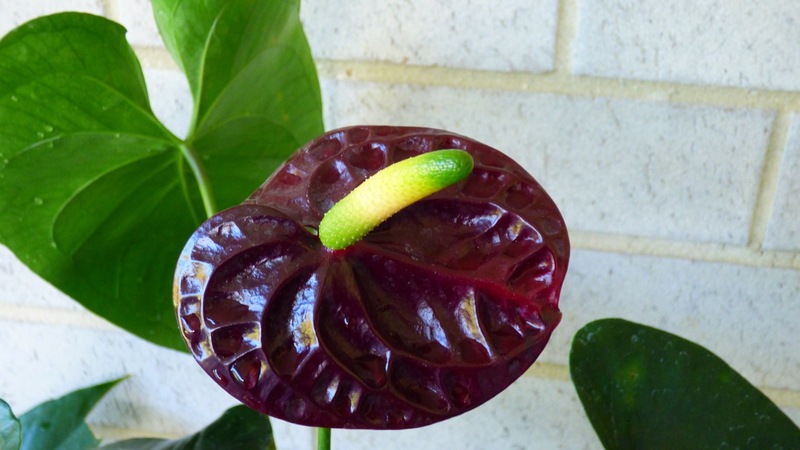 The Anthurium flower itself is a cluster of small perfect flowers contained in dense spirals on a spadix – a type of spike inflorescence where tiny flowers are borne on a fleshy stem. Anthurium flowers are referred to as perfect because they contain both male and female structures. The spadix is often elongated into a spike shape, but it can also be globe-shaped or club-shaped and in some varieties, it can be a crazy spiral. I think this new addition to my ever increasing variety of potted plants is just beautiful, and there’s a new flower about to open. I have a few different coloured Anthuriums now, though not all are in flower at the moment. One plant has been inside the house for over a year and it has never flowered, so it’s been banished outside in the hopes that blooms appear. Fingers crossed because it was a gift and I have no idea what colour it is, though my friend telling me that its purple does ring a bell. I was reading that fruits develop from the flowers on the spadix and they are juicy berries varying in colour and usually containing two seeds. I don’t think I’ll be eating them if they do appear because Anthuriums are poisonous due to calcium oxalate crystals and the sap is irritating to the skin and eyes. But it’s not all bad news. 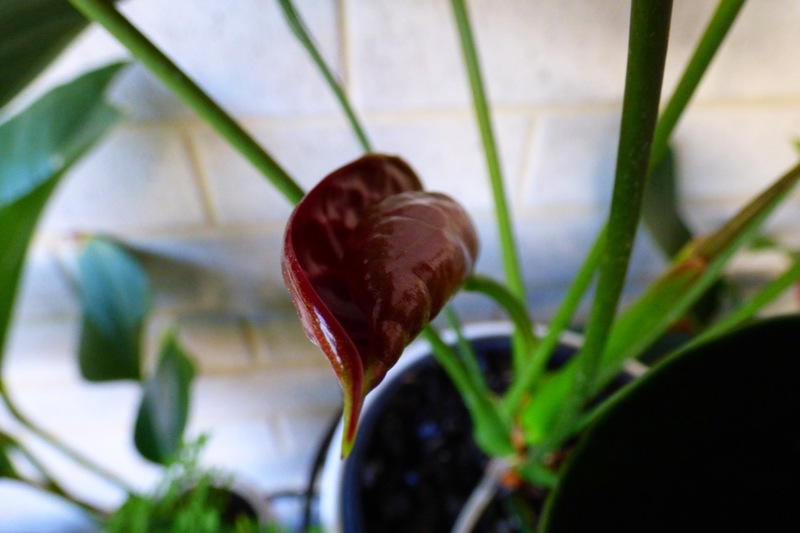 Anthurium andraeanum is one of the plants listed in the NASA Clean Air Study as effective in removing formaldehyde, xylene, toluene, and ammonia from the air. How cool is that? I think they are a very impressive plant and even though there are approx 1,000 difference species, rest assured, I will NOT be collecting them all.